Hey there! Thanks for dropping by Barefoot Dokusha! Take a look around and grab the RSS feed to stay updated. See you around! Lexi Ryan just ran away to join the circus, but not on purpose. A music-obsessed, slightly snarky New York City girl, Lexi is on her own. After making a huge mistake–and facing a terrible tragedy–Lexi has no choice but to track down her long-absent mother. Rumor has it that Lexi’s mom is somewhere in Florida with a traveling circus. When Lexi arrives at her new, three-ring reality, her mom isn’t there . . . but her destiny might be. 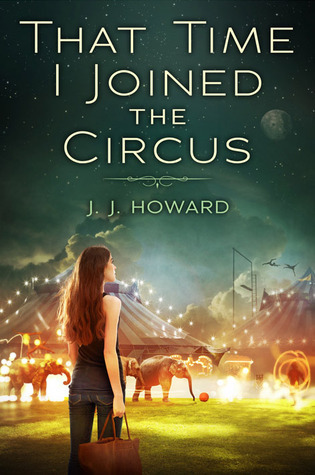 Surrounded by tigers, elephants, and trapeze artists, Lexi finds some surprising friends and an even more surprising chance at true love. She even lucks into a spot as the circus’s fortune teller, reading tarot cards and making predictions. But then Lexi’s ex-best friend from home shows up, and suddenly it’s Lexi’s own future that’s thrown into question. With humor, wisdom, and a dazzlingly fresh voice, this debut reminds us of the magic of circus tents, city lights, first kisses, and the importance of an excellent playlist. Put to the streets after a tragic accident, Lexi is on the search for her mother. The last known address is with a traveling circus. She had to leave everything she knew in NYC and take a bus to Florida to meet the circus that she as told her mother was traveling with. Once getting there, her mother was no here to be found. Now she was very far fro home with little money and no home. Luckily she was able to get a job with the circus and have shelter and food. Throughout the book Lexi learns more about life, and how to deal with the loss of her father, a mother that abandoned her at a young age, and relationships. The story jumps back and forth from the present to the past. This allows you to understand some of the things she is dealing with in the present that happened in the past. Vitacost – $10/10 for new customers!